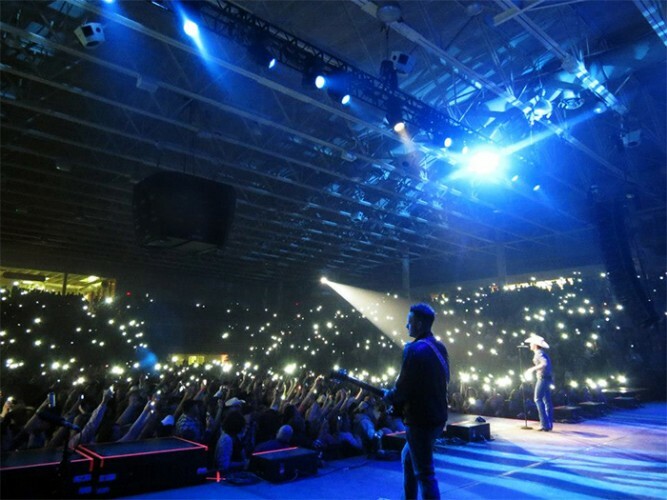 Special Event Services (SES) deployed an immense Outline GTO-based sound system for the 2013 Justin Moore Outlaws Like Me concert tour, presented at major arenas and concert venues across the country. With Outline’s exclusive OpenArray 3D Simulation Software, SES employed the company’s integrated flying hardware system to achieve audience coverage and uniform, sterling sound quality at each stop. 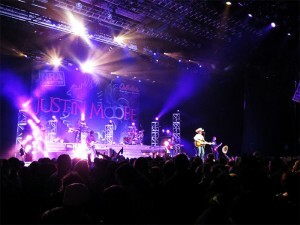 This setup was elemental to delivering the excitement of Justin Moore’s performances for both his heavy country rock hits and emotional ballads. The entire mix of Outline GTO, GTO-DF, Butterfly, Mantas, LIPF and Lab 21 speakers offered audience members a sonic experience unmatched by any other system on the market. "The most significant aspect of the Outline system that we used for Justin Moore is that it replicates everything I give it without coloration," says Jeff Oliver, front-of-house engineer for Justin Moore. "Every stage source, from all the guitar amps and microphones, to the drum kit and Justin’s vocals, are faithfully reproduced at each venue with unbelievable consistency. Such replication can be difficult to achieve live, and the Outline system does so with ease. The system puts out exactly what I put in, and I think that is the hardest aspect to achieve for live, touring concerts. With Outline, the sound is so good that the audience members feel like they are on the stage with the band no matter where they are sitting. Once you work with Outline, you get the chance to learn how an intimate sound can be achieved in a large arena." SES is a veteran company that has earned an international reputation for designing and deploying audio and lighting systems satisfying the needs of a broad range of audiences and venue types. The team at SES relies on the sophisticated integrated flying hardware system included on each speaker in conjunction with Outline’s exclusive OpenArray 3D simulation software to achieve stunning results. "Outline’s OpenArray software and the design of the cabinets make setup very fast and straightforward," says John Kaylor, systems engineer for SES. "We go in, measure the room and do all of the predictions in OpenArray, which is really simple to use. The result is a very detailed and accurate sound across every venue. The system’s automatic function chooses the angles for each cabinet. We set each cabinet in the array accordingly and fly the system quickly and accurately every time. I believe that the Outline system is one of the most powerful and easy-to-use products I’ve ever encountered. When you need it, the system delivers." Oliver also helps with flying the system, and while he appreciates its ease, he loves the results. "I’ve heard elements of our band out of this PA system that I never knew were there before," he states. "The Outline system delivers the level of clarity you generally see in a recording studio, a much more controlled listening environment. The stereo imagery is second to none. There are nuances that you just don’t hear in other speaker systems. The way Outline’s high-end drivers and wave guides are designed reproduces the top end better than anything I’ve ever heard in my entire life. When you pan a guitar in the sound field, you can feel it in the room, you can feel it shift. It just kind of blows your mind that the system reproduces all the way up to 18-19 kHz where all that pretty sonic information is found, like overheads in a drum mix. Things like that give you that spatial feel at a concert, and that is good for the performer and the audience. We have achieved this all because of Outline."